In the early days of the (commercial) Internet, Inktomi was considered a search engine pioneer. It was a search leader and favorite of many users but as was the case in the heady days of the Internet bubble, it went went from top of the mountain to bottom of the heap (eventually bought by Yahoo) in the span of a few years. And while we may reminisce about the name Inktomi, this post is about a totally different Inktomi – a 1,500 kilometer wide crater seen here on the moon Rhea. We are huge fans of Cassini spacecraft’s work as it has long been studying Saturn and its moons. 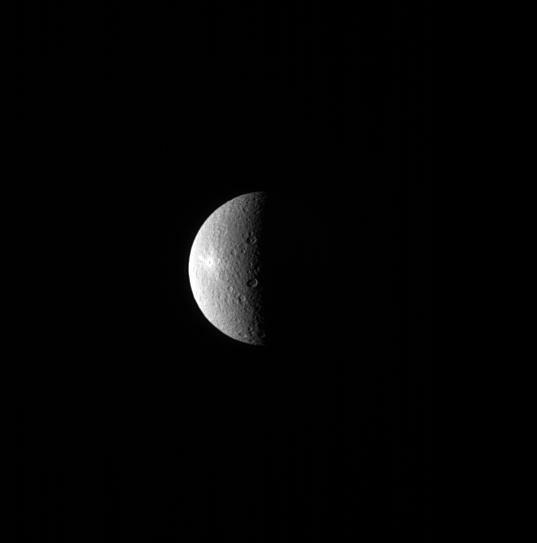 It took this picture in July 2013 while it was about 1.6 million kilometers from Rhea using its narrow angle camera.